With the hectic pace of holiday parties and to-dos, keep entertaining simple by letting guests DIY their own festive cocktail. A self-serve hot chocolate station is the perfect answer to pleasing a gaggle of guests and taking the guesswork out of matching everyone’s tastes. Add some festive straws and mugs, and let guests whip up their own cup of cheer. Hot chocolate is universally beloved, easy to prepare and comes in a variety of flavors like dark chocolate or even white chocolate. Set up two crocks or a couple of thermal carafes with pre-made hot chocolate. (Using mixes is fine.) 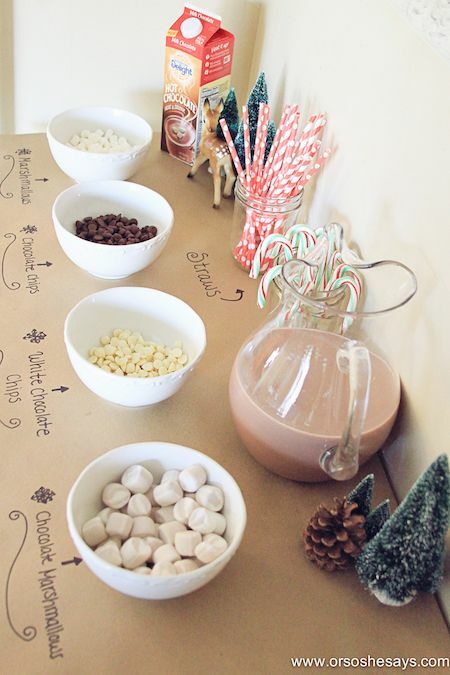 Keep the hot chocolate flavors simple so guests can add their own pizzazz. Then, set up your liquor and liqueurs. (Pro tip: Use the smaller airplane-sized liquor bottles for easy measuring.) Here are a few mixers that will transform any hot chocolate into a dreamy hot choc-tail: Irish cream liqueur, Kahlúa or coffee-flavored liqueur, Fireball or cinnamon whiskey, Bulleit bourbon, crème de menthe, marshmallow-flavored vodka, dark spiced rum. And no hot chocolate is complete without the trimmings: mini marshmallows, chocolate sprinkles, coconut shavings, cayenne (just a pinch! ), cinnamon sticks, caramel sauce. 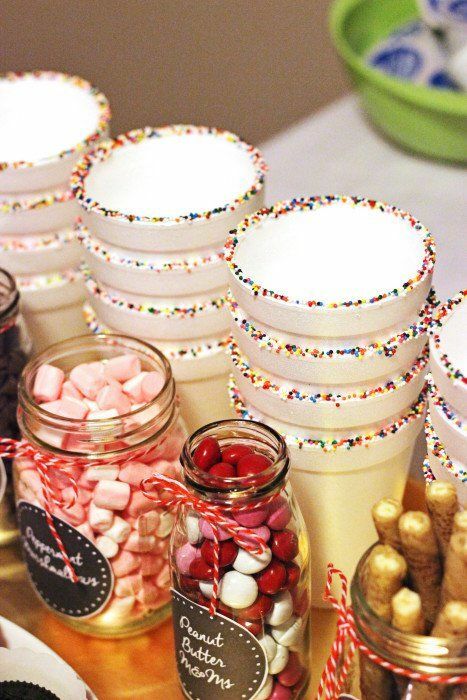 Fun details can make an inexpensive spread look extra classy — like sprinkles on the rim on Styrofoam cups, or butcher paper as a tablecloth you can write on. Helpful if you can't label the jars themselves. You can even get some free printable labels here.